Autonumber fields are fields that automatically generate alphanumeric strings whenever they are created. Makers can customize the format of these fields to their liking, and then rely on the system to generate matching values that automatically fill them in at runtime. 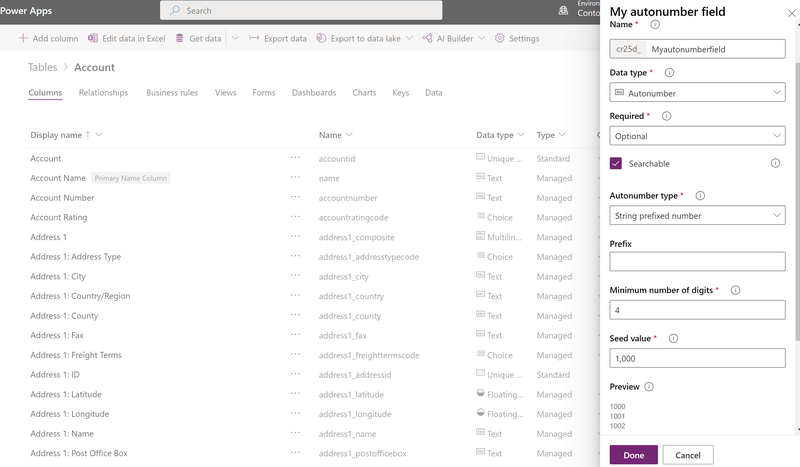 While autonumber fields are formally just text fields with additional functionality built on top of them, PowerApps simplifies this concept by simply exposing Autonumber as a distinct data type under the Text category. It is important to note that the classic solution explorer doesn't support creating or managing autonumber fields. To create an autonumber field, follow the same steps to create a field and simply select Autonumber from the Data type drop-down list box. You may also activate autonumber functionality on an existing text field by opening the field and selecting Autonumber from the Data type drop-down list box. Similarly, autonumber functionality can also be disabled at any time by opening the field and selecting a different option in the Data type drop-down list box. In order to make the creation of autonumber fields easier, there are a few pre-defined default autonumber types to capture the most common scenarios. The most common autonumber format is a simple string prefixed number. When this type is selected, the autonumber will consist of an automatically incrementing number with an optional string constant prefix. For example, a string prefixed number with the prefix Contoso would generate records such as Contoso-1000, Contoso-1001, Contoso-1002, and so on. Another common autonumber format is a date prefixed number. When this type is selected, the autonumber will consist of an automatically incrementing number with a formatted date prefix. The date portion of the record will reflect the current date and time at which the record was created in UTC time. We have provided a number of various date formats to choose from. For example, a date prefixed number would generate records such as 2019-26-02-1000, 2019-27-02-1000, 2019-28-02-1000, and so on, depending on the current date and selected date format. For more advanced makers with specific use cases, we provide the option to fully customize the desired format of an autonumber field. The format may consist of string constants, automatically incrementing numbers, formatted dates, or random alphanumeric sequences. For detailed information about how to define custom formats, see AutoNumberFormat options. The seed value of an autonumber field is the starting number that is used for the number portion of the format. For example, if you want an autonumber field to generate records such as Contoso-1000, Contoso-1001, Contoso-1002, and so on, then the desired seed value is 1000, because that is the value that your number sequence starts with. Autonumber fields have a default seed value of 1000, but you may set a custom seed value if you wish. Designating a custom seed is currently only supported when creating a new autonumber field. Setting the seed only changes the current number value for the specified attribute in the current environment. It does not imply a common start value for the attribute. The seed value is not included in a solution when it's imported in a different environment. Sign in to the PowerApps portal. On the left pane expand Data and select Entities. Select the entity that you would like to add an autonumber field to and then select the Fields tab. On the toolbar, select Add field. On the right pane, enter a Display name and select Autonumber for the Data type. Select an autonumber type or keep the default String prefixed number option. Customize a seed value or keep the default value of 1000.